This year, two groups of generous donors have challenged MoBikeFed members and supporters to raise $30,000. That means that your membership/donation between now & March 31st will be matched TWICE. We're making good progress--as of January 22nd, we are $3431 towards our goal of $30,000. But we need YOU to help us get the rest of the way there! 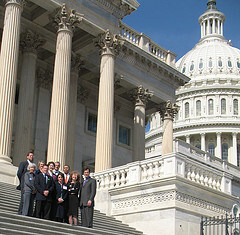 MoBikeFed is a member-supported and member-oriented organization. The majority of our support comes from individual members and donors like you--over half is from ordinary people who give a small amount--$10 or $20 or $50 or $75. That means that we exist as an organization to meet the needs of our members and carry out the agenda for better, safer bicycling, walking, running, and trails that is supported by our members. 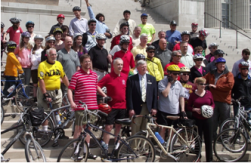 We are the only organization focusing exclusively on statewide bicycle, walking, running, and trails advocacy in Missouri. Your membership and support powers our work. Want to kick your support up a notch? Become a Sustaining Member - monthly donations starting at $5/month help us create a dependable, solid financial base for our important advocacy work. And . . . no more renewal notices! What's at stake? What does your membership support? An ambitious legislative agenda, including banning harassment of cyclists and pedestrians, stiffening the safe passing requirements for cyclists and pedestrians, and increasing penalties for dangerous drivers who injure or kill. 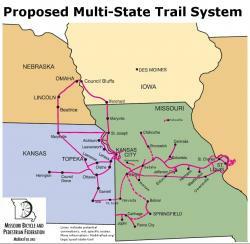 Organized opposition to the proposed new 200+ mile statewide Rock Island Trail is growing and becoming far more dangerous, as the Missouri Farm Bureau formally announces its opposition to the trail. Unless we organize and speak up just as they are, there is a chance they could stop the trail in its tracks. MoDOT is preparing for the next round of the state transportation funding issue--and unless we continue to speak up, bicycle, pedestrian, and trail funding will be neglected as priorities for billions of dollars of funding over upcoming decades is worked out. We will continue to work on the many priorities our members have identified as part of our Vision, including: Complete Streets, Bicycle and Walk Friendly Communities, statewide bicycle routes, statewide trails system, updating MoDOT bike/ped policy, federal transportation funding, Capitol Day in Jefferson City, the National Bike Summit Congressional visits in Washington DC, encouraging adoption of bike/ped priorities across Missouri, continuing to monitor implementation of tens of millions of dollars worth of High Priority Bike/Ped Projects across Missouri, and much more. Join, renew, or make a donation here. Your donation will be matched TWICE. » Next story: Annual Reports for 2012 - What has MoBikeFed done for YOU lately? Thank you, generous members & donors! We exceeded our $30,000 triple match fundraising goal!